This morning, the Region of Waterloo announced that it has reached a settlement with the greenfield developers who appealed the Region’s new Official Plan to the Ontario Municipal Board. A map released by the Region, showing changes based on the settlement agreement. 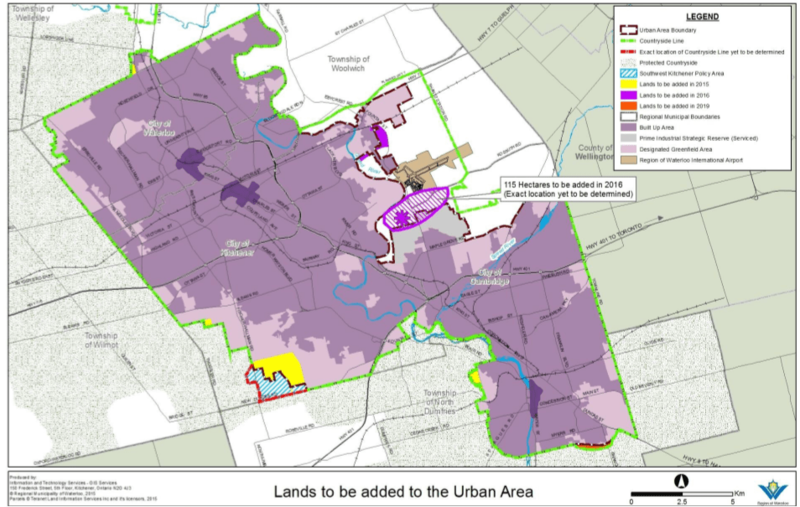 The agreement, which still must be approved by the OMB, would open up 255 hectares of new land to settle the original dispute, with an additional 198 hectares in the coming years to accommodate new higher population growth projections. Developers had asked for 1053 hectares of new land for urban development to 2031. While this is a compromise, it’s a good compromise that will allow us to move forward with smart growth approaches in our community. It will help protect our farmland and environmentally sensitive areas, while allowing us to encourage more people and jobs in built-up areas to create more liveable urban areas. This deal means we won’t have to rely on the unpredictable court system to fix the mess left by the OMB, and can move forward sooner with a locally-designed solution. You can see the Region’s press release on the deal here, and their full report here. You can also check out our press release. Congratulations to all those at the Region of Waterloo who have been working so hard on this deal, and to all of you for your ongoing support of our community’s smart growth vision. Our community’s dedication has been a crucial part of this success. This entry was posted in Uncategorized on May 26, 2015 by Kate Daley. Today, the Waterloo Region Record ran a new story about the ongoing negotiations between the Region of Waterloo and a handful of developers, whose appeal of the Regional Official Plan resulted in a 2013 Ontario Municipal Board ruling against the Region’s efforts to rein in urban sprawl. While it’s been public knowledge that such negotiations have been ongoing since early 2013, it is noteworthy that both Regional Chair Ken Seiling and a planner for some of those developers sound hopeful that a negotiated settlement is still possible. Fortunately, our regional government is doing what it can, and isn’t simply relying on the outcome of negotiations to protect our future. The article reports that the Region is still pursuing a judicial review of that fateful OMB decision, and if a satisfactory settlement isn’t reached, court dates for the appeal are set for January of 2016. You can read the full article on the Record’s website here. This entry was posted in Uncategorized on March 4, 2015 by Kate Daley. We knew all along that the Region of Waterloo’s bold defence of its Official Plan would take time. Since the Ontario Municipal Board gutted the visionary and crucial plan in a January 2013 ruling, and the Region decided to fight the ruling, we’ve been glad to see slow and steady progress being made. First, the Region continues to stand up against the ruling through the courts. The Waterloo Region Record reported in mid-October that the Ontario Municipal Board took a look at its own process leading up to the ruling. Despite the Region’s concerns that private training for Board members provided by the developers’ primary witness during the case led to bias in the Board’s decision-making, the Board ruled in September that it was not biased. As The Record explains, Regional Council was unanimous in its vote to pursue a judicial review. “The massive support for regional council opposing the OMB decision … speaks volumes for the desire of people here not to be paving over farmland and preserving our rural lands,” Regional Chair Ken Seiling said. The Record story also includes a handy timeline of events in this case; you can read the full story here. Rob Horne, Region of Waterloo’s commissioner of planning, housing and community services, said the province must make aspects of the plan related to growth targets more concrete, make portions of the growth plan unappealable to the OMB and attend appeal hearings to defend already approved densities in municipalities taken to the OMB. “What we’d like to see is the province actively attending those OMB hearings to support municipalities and the plan they’ve approved,” said Horne, noting the province has to approve municipal official plans before municipalities can implement them. Horne’s comments come after the province’s environmental commissioner, Gord Miller, raised concerns about the implementation of the Places to Grow Growth Plan, since most municipalities aren’t meeting their density targets under the plan. The Post story, with more detail, is available here. In short, despite its slow pace, lots of work continues to protect our community’s future. We’ll keep you updated as this hard and important work progresses. This entry was posted in Uncategorized on November 1, 2014 by Kate Daley. We’re pleased this morning to see a story in the The Record about the court case on the Region’s official plan. The enormous public interest in this case continues. Unfortunately, justice moves slowly in our court system. As the story notes, it has been well over a year since the Region announced that it would seek a judicial review of the Ontario Municipal Board’s ruling against its Official Plan in Divisional Court. Indeed, it has been 16 months since the Province of Ontario took the rare step of joining with the Region to fight a decision of its own tribunal in court. “There have been discussions with some of the parties as to whether there’s ability to settle some of these things, but as of today there are no settlements and we’re still waiting to hear on the issues from the board,” Seiling said. “Anybody’s preference always is if you can achieve a settlement without getting before the courts or another full hearing that would be preferable, but that takes everybody willing to come together,” he said. For now, we wait for more news on this case. But we don’t have to wait to talk about broader issues of growth, urban sprawl, and liveable communities. Discussions on these topics continue, here and across the province. As the fall approaches and the municipal election gets into full swing, there’s lots to talk about. This entry was posted in Uncategorized on August 26, 2014 by Kate Daley. Paige Demond writes in The Record about the Kitchener-Waterloo riding with some quotations from candidates about the OMB ruling. Concerns about our local OMB ruling got some attention in neighbouring Guelph on Monday from many of the candidates, as the Green Party leader paid a visit. Many candidates in Waterloo Region responded to our Smart Growth Waterloo Region Election Questionnaire, which asked specifically about the OMB ruling on the Region’s Official Plan, what they would do to protect the OP, and their views on intensification for liveable cities and farmland protection. The Tri-Cities Transport Action Group included a question on its questionnaire regarding municipal access to appropriate land use planning tools, and a number of candidates mentioned the OMB ruling in their response. This entry was posted in Uncategorized on June 10, 2014 by Kate Daley. We recently sent our Backgrounder and 2014 Ontario Election Questionnaire to all the candidates for MPP in the four ridings in Waterloo Region. The responses we have received can be viewed by following this link. If we receive any additional responses from the candidates, we will endeavour to add them as soon as possible. If you are a Waterloo Region candidate and your response does not appear below, please contact us at election.survey@smartgrowthwaterloo.ca to be included. This entry was posted in Uncategorized on June 5, 2014 by Kate Daley. From left: Kate Daley of Smart Growth Waterloo Region, Kevin Thomason of the Grand River Environmental Network, Rob Horne of the Region of Waterloo, Aidan Grove-White of Environmental Defence, and moderator Mike Farwell at Smartening Up Growth in Waterloo Region. 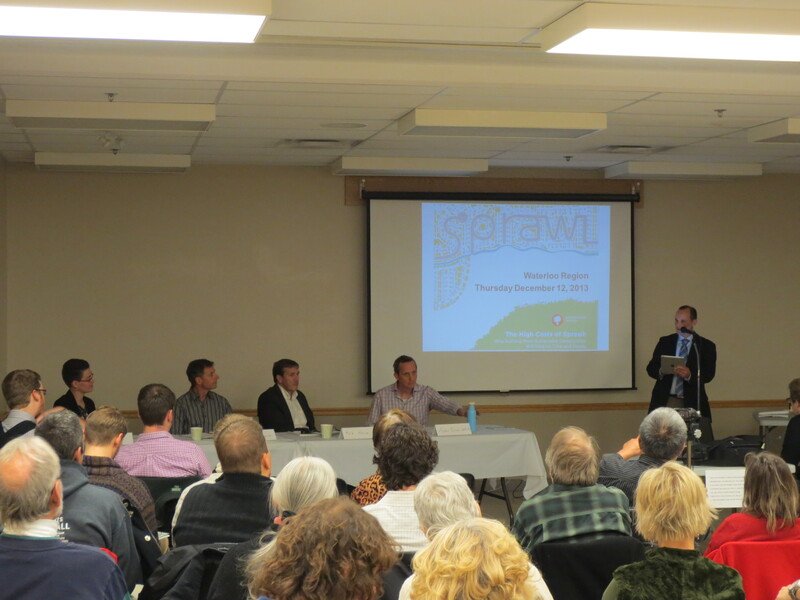 On Thursday, December 12, more than 80 people packed into the multipurpose room at the Downtown Community Centre in Kitchener to learn more about the costs of sprawl and the benefits of Smart Growth in Waterloo Region. You can follow along with the conversation and see what people were saying. This entry was posted in Uncategorized on December 13, 2013 by Kate Daley.